This post goes out to a great young man by the name of Joseph Robinson. I was lucky enough to have the pleasure of knowing and working with Joe for the past 4 months. He ALWAYS had a smile, never had anything bad to say about anyone, and was a great person. Joe had a true passion for cycling. He aspired to someday own his on Bicycle Retail Store. There has not been a day gone past since his death that I don’t think about Joe. With so many articles about Joe in the media, I would like to refrain from writing about the publicized details. Rather, our good Friend Nate from Team Kasel Cycling wrote some very nice words from his point of view that I would like to share. 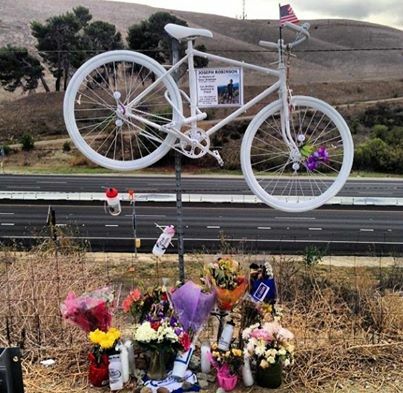 Yesterday, February 5, 2014, the OC cycling community demonstrated its solidarity by showing up at 6:30 A.M. on a weekday to pay tribute to a fallen cyclist. Twenty-one year old Joseph Robinson was killed by an intoxicated 18 year old on a rural Orange County road on super bowl Sunday at 7 A.M. Senseless and tragic, on so many levels. It’s shocking to the soul and senses. And yet, such things can galvanize the collective community. At least I hope this does. I can’t speak to my knowledge of Joseph – I said hello to him and shared small talk with him perhaps twice – but I can speak to the experience shared by myself and 300+ others on his memorial ride yesterday. I first must thank the people responsible for organizing this memorial ride and ghost bike, namely Joseph’s employer, Jax Bicycle Center and Dave Hanson the owner. To put such an effort together in three days is incredible. It’s an honor for our team to be supported by Jax Bicycle Center. (BTW – a memorial fund has been setup through PayPal on the Jax Bicycle website.) The CHP and police support was quite impressive as they had teams of motorcycles shutting down intersections as our ride progressed up to the site of the ghost bike. And for the cycling community – riders, teams, shops, sponsors, etc. – to rally behind the ride to bring awareness and respect to what transpired over the weekend was marvelous to be a part of. There was much consoling and shaking of heads and acknowledgement that it could be any one of us at any given time. It’s scary sometimes when on the road with metal missiles flying past you as bike and carshare a patch of asphalt. Occasionally, there are serene patches of empty rural roads, which we as cyclists, are drawn to and yearn for – and even on these serene roads tranquility can be lost, forever. While it doesn’t bring Joseph back to life, hopefully out of this tragedy some awareness is fostered and motorists – cyclists and cars alike – can learn to share the road better. #3feet please. We miss Joe very much. Our thoughts go out to all of Joe’s family, friends, and coworkers. We would also like to thank all the cyclists that celebrated the life of Joeseph Robinson. We cannot express our appreciation enough to all the cyclists, bicycle shops, industry vendors, and law enforcements that made the Memorial Ride so amazing. Over 300 cyclists were police escorted during the Memorial Ride. We thank each and every one of you for the support! We have had so many pictures submitted from clients, riders, and media of the event. Too many to share on this post. Take a peek at our Facebook page to view hundreds of photos and some video too! Jax is also continuing to take donations for the Joseph Robinson Memorial. 100% of the raised money is going to the Robinson family to help in this time of need. Click on the image to donate.